WAIST HIGH: Paul Weller's Wake Up The Nation Nominated For Mercury Prize. Paul Weller's Wake Up The Nation Nominated For Mercury Prize. 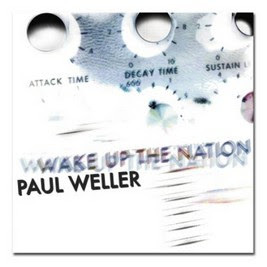 The tenth studio album from Paul Weller, Wake Up The Nation has been nominated for the highly prestigious Mercury Prize, currently known as the Barclaycard Mercury Prize. A full-circle affair, the 16-track album reunited Paul with Bruce Foxton whom he had not worked with since 1982 after a falling out over Jam related royalties. This is Paul's second nomination for the Mercury Prize, his album Wild Wood made the list in 1994. "The overall winner will be judged by a panel of music industry luminaries and announced at a ceremony in London on September 7th." According to NME, Weller has reportedly given up alcohol after several public incidents including being banned from a BMI flight after a drunken rage and being photographed collapsed on the street in Prague with his girlfriend. A friend said: "He decided to knock the drink on the head two or three months ago. He's enjoying a new lease of life."